Yes, we all think of Disney in terms of cartoons and I am certain most people look down on cartoons as something for children, but there is depth and meaning in Disney's work and in cartoons in general. I've never forgotten an interview with Chuck Jones, associated with Bugs Bunny, in which he said that he and his associates were really making cartoons for themselves. I have noted over the years that cartoons have a great deal of adult content. - Simpsons, anyone? Destino has an odd backstory in that Disney Studios and Dalí collaborated in 1945 but then their work was shelved. It wasn't until 1999 that Disney's nephew, Roy E. Disney resurrected the project. This film was completed in 2003 following the original storyboards done by Dalí and Disney studio artist John Hench. FYI: This video clip is available in HD. Click on the "gear icon" to change the resolution. The film tells the story of Chronos, the personification of time and the inability to realize his desire to love for a mortal. The scenes blend a series of surreal paintings of Dali with dancing and metamorphosis. The target production began in 1945, 58 years before its completion and was a collaboration between Walt Disney and the Spanish surrealist painter, Salvador Dalí. 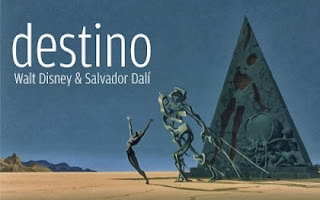 Salvador Dali and Walt Disney Destiny was produced by Dali and John Hench for 8 months between 1945 and 1946. Dali, at the time, Hench described as a "ghostly figure" who knew better than Dali the secrets of the Disney film. For some time, the project remained a secret. The work of painter Salvador Dali was to prepare a six-minute sequence combining animation with live dancers and special effects for a movie in the same format of "Fantasia." Dali in the studio working on The Disney characters are fighting against time, the giant sundial that emerges from the great stone face of Jupiter and that determines the fate of all human novels. Dalí and Hench were creating a new animation technique, the cinematic equivalent of "paranoid critique" of Dali. Method inspired by the work of Freud on the subconscious and the inclusion of hidden and double images. Dalí said: "Entertainment highlights the art, its possibilities are endless." The plot of the film was described by Dalí as "A magical display of the problem of life in the labyrinth of time." Walt Disney said it was "A simple story about a young girl in search of true love." I couldn't remember where I first saw this 6 minute film until I read the Wikipedia article about the public showings of the film. I saw it at The Tate in London, England in 2007. Wow for the film; wow for the museum; and wow for a trip to England. As an aside, I have visited the Salvador Dalí Museum in St. Petersburg, Florida. I was more than surprised when I discovered this museum houses the largest collection of original Dalí artwork outside of Europe. It is a must see. They moved into a larger building in 2011 so I must go back and see it all over again. Dalí was an amazing artist and quite the individual. Then again, so were Disney and his studio. It is just more than interesting to see the collaboration of the surreal and animation. Although I only show links associated with the film, the people mentioned above, Roy E. Disney and John Hench are interesting people unto themselves and worth reading about. Even those we consider to be lesser lights because of our ignorance are still notable. The world is filled with amazing people. Destino is an animated short film released in 2003 by The Walt Disney Company. Destino is unique in that its production originally began in 1945, 58 years before its eventual completion. The project was originally a collaboration between American animator Walt Disney and Spanish Surrealist painter Salvador Dalí, and features music written by Mexican songwriter Armando Dominguez and performed by Dora Luz. Salvador Domingo Felipe Jacinto Dalí i Domènech, 1st Marqués de Dalí de Pubol (May 11, 1904 – January 23, 1989), known as Salvador Dalí, was a prominent Spanish surrealist painter born in Figueres, in the Catalonia region of Spain.